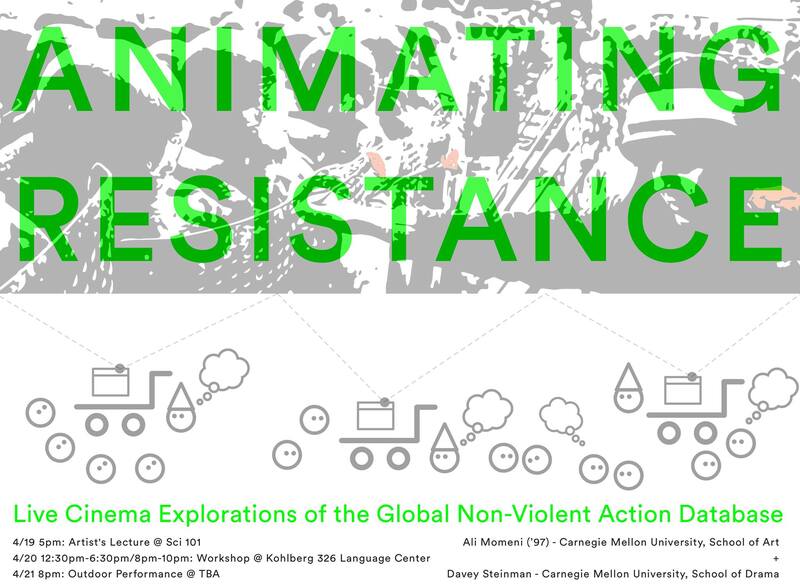 The theme for this workshop and performance will be Swarthmore College’s Peace and Conflict Studies’ inimitable and inspiring Global Nonviolent Action Database. Momeni and the workshop participants will collaborative create and perform a live cinema/projection performance that consists of animations depicting and annotating the contents of this database in playful and performative ways. Momeni will be assisted by artist and MFA Candidate Davey Steinman for this performance. Momeni was born in Isfahan, Iran and emigrated to the United States at the age of twelve. He studied physics and music at Swarthmore College and completed his doctoral degree in music composition, improvisation and performance with computers from the Center for New Music and Audio Technologies at UC Berkeley. He spent three years in Paris where he collaborated with performers and researchers from La Kitchen, IRCAM, Sony CSL and CIRM. 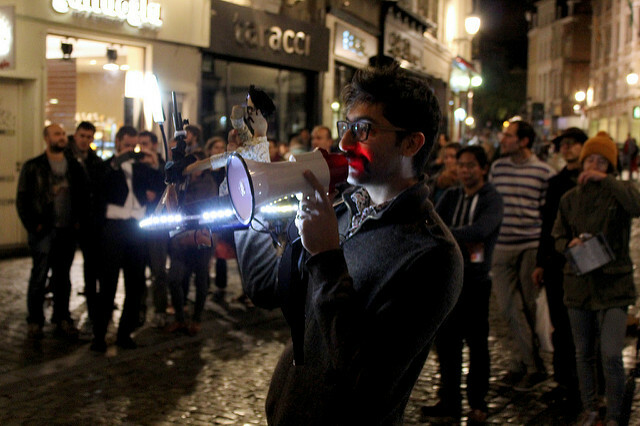 Between 2007 and 2011, Momeni was an assistant professor in the Department of Art at the University of Minnesota in Minneapolis, where he directed the Spark Festival of Electronic Music and Art, and founded the urban projection collective called the MAW. Momeni is currently an associate professor in the School of Art at Carnegie Mellon University and directs CMU ArtFab, teaches in CMU’s IDEATE, Music Technology and Masters in Tangible Interaction Design degrees. 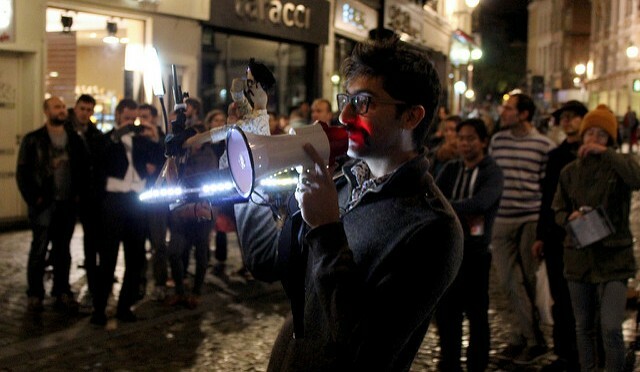 Momeni’s current research interests include performative applications of robotics, playful urban interventions, interactive projection performance, machine learning for artists and designers, interactive tools for storytelling and experiential learning, mobile and hybrid musical instruments, and the intersection of sound, music and health. Davey T Steinman is an artist and explorer working at the crossroads of performance and technology. Davey is currently pursuing an M.F.A. in Video and Media Design in the School of Drama at Carnegie Mellon University. The following piece appeared in the most recent issue of The Phoenix. Theater of Witness is a series of staged dramatic performances and cinema pieces through which subjects recount complex personal histories. 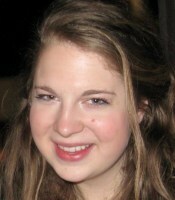 It was brought to Swarthmore on Monday, February 10 by its founder and director Teya Sepinuck. Sepinuck served as adjunct faculty in member in the college’s dance department for almost 20 years before leaving to found the Philadelphia-based TOVA: Artistic Projects for Social Change in 1991. 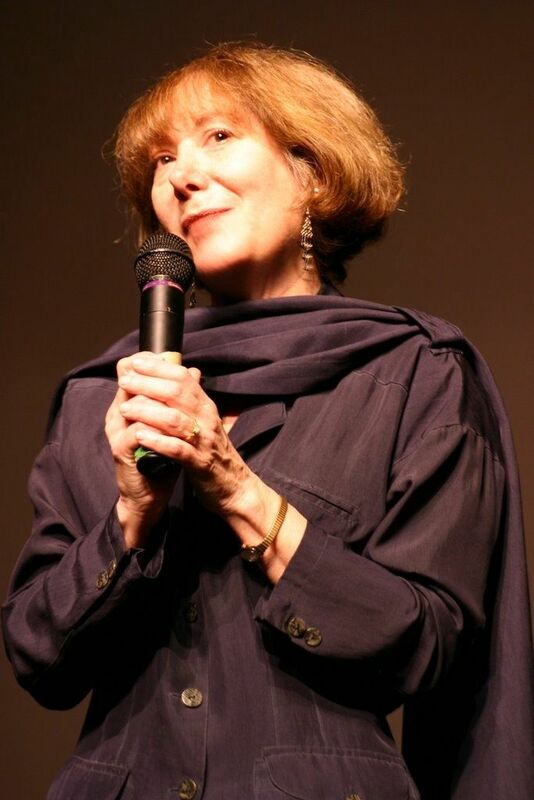 More recently, she has been in Northern Ireland expanding the Theater of Witness program.The program opened with Sepinuck reading a short passage from her book, describing an encounter with children who were unwitting victims of war. It seemed generic, too distant to be meaningful. Sepinuck then moved towards presenting the actual “theater” of witness.She started with some footage of a young boy narrating on and off camera, accompanied by footage of his Philadelphia neighborhood. It is part of a piece connecting mothers of young gang violence victims to the perpetrators of said violence. 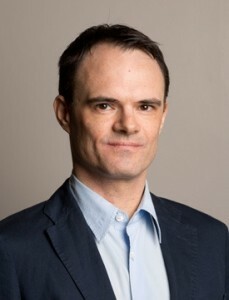 The relationship between victim and perpetrator is essential and unique to Sepinuck’s work.“It’s harder to identify with the perpetrator,” said Sepinuck. “But it’s important.” After a brief and interesting, if not completely comprehensive, introduction to the methods of the program, Sepinuck showed a few particularly powerful Theater of Witness performances.The first video featured a man named Hakim Ali telling his story. Ali had committed acts of gang violence, and had not spoken about it or outwardly reflected on it before participating in Sepinuck’s program. “It’s very healing,” said Sepinuck. On stage he is full of emotion, the kind of regret and loss that is easy to feel and almost impossible to communicate. Sepinuck shared a story about how the mothers of victims and convicted perpetrators alike were in tears, moved to unabridged expression by the stories of their sons. But none of them were shown on screen, and the distance remained. Next was the story of a couple from Sepinuck’s film “Raising Our Voice.” The work was inspired by a man who called Sepinuck, requesting to participate after having seen one of her programs. He confessed to committing domestic abuse and told Sepinuck that he kept hearing her name when he was praying. The film opens with a monologue from the man’s wife, who decided to participate in the program after watching him. She fights tears on screen as she outlines a history of helplessness and running away, ending on a note of strength and confidence. The scene then cuts to the man’s own story as the film follows him through a saga of masculine pressure that poisoned his protective instincts of love. The two end up on stage together, dancing closely. The “healing” capability that Sepinuck had referred to earlier was more than just cathartic introspection. It unifies parties that have damaged each other. As the couple dances on screen, there is not exactly forgiveness, but there is still love. Sepinuck then presented her more recent work on the lives of those who had lost loved ones due to separatist and military violence in northern Ireland. She showed individually narrated short films: one of a young woman named Victoria, whose father was killed in an IRA related bomb attack and one of a young man named Fionbarr, whose father died at the hands of suspicious British police. 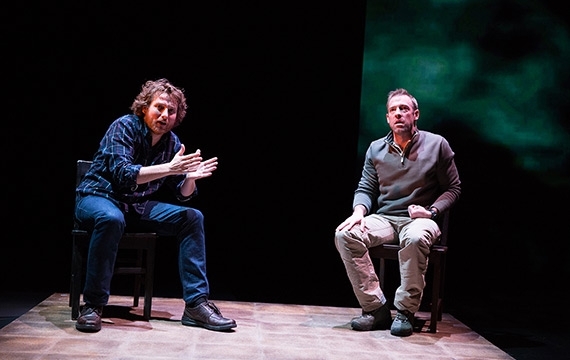 Sepinuck then showed a Theater of Witness project featuring a young woman who had given herself to the IRA years ago as she tells the story of her impassioned extremism and its abrupt end due to a brain hemorrhage. She is then shown on stage together with the wives of men killed by IRA activity, in an example of the show’s careful exploration of the relativism of innocence and the universality of pain. To conclude, Sepinuck showed material from her film “Living with Life”, a Theater of Witness project done at the State Correctional Institute in nearby Chester. A group of men sentenced to life in prison are interviewed about their free lives and current emotions at an unexpected, almost inconceivable depth. This is followed by their performance of an original composition by the prisoners, about how they must hold on to some fragments of sanity while confined. It is a perspective on life that, as consumers of a media saturated with grotesquely fantasized prison environments, is almost never seen. Join Teya Sepinuck, founder and Artistic Director of Theatre of Witness for an inspiring multi-media program of films and life stories from her work creating original testimonial theater with those whose stories haven’t been heard in society. For the past 29 years, Teya has created Theatre of Witness productions in the US, Poland and Northern Ireland with ex-combatants, victims and survivors of war, prisoners and their families, refugees, and asylum seekers, and those affected by inner city violence, poverty and homelessness. Teya will speak personally about the power of bearing witness and using personal and collective story to inspire healing and peace building both for the performers as well as audiences. Teya is the founder and artistic Director of Theatre of Witness – a form of performance in which the true life stories of those who haven’t been heard in society are performed by the people themselves as a way for audiences to bear witness to issues of suffering, transformation and peace. She is recently back from Northern Ireland where The European Union awarded two multi-year Peace grants for her work with former soldiers, security forces personnel, and victims and witnesses of the more than 40 years of violence from the ‘Troubles’. The productions have since been made into film documentaries for ongoing dissemination in workshops, and one of her most recent productions has aired on the BBC. Her work humanizes the other and is founded on the premise of ‘finding the medicine’ in stories of deep suffering. Teya’s book, Theatre of Witness, Finding the Medicine in Stories of Suffering, Transformation and Peace was published by Jessica Kingsley Press. Teya taught at Swarthmore College from 1974-2002. 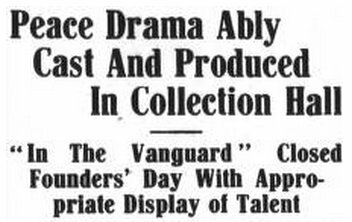 This story in The Phoenix, Swarthmore College’s student newspaper, from October 27, 1914, only three months after the start of World War I, was brought to our attention this week. Swarthmore is celebrating its sesquicentennial this year.